Delve into the natural world of past and present with admission to Los Angeles County's Natural History Museum. Encounter extraordinary dinosaurs, experience impressive nature, explore intriguing dioramas, and marvel at one of the most impressive gem and mineral collections in the world. The museum also features a seasonal Butterfly and Spider Pavilion and is home to one of the top fossil collections in California. Perfect for families as well as solo travelers, it's both an entertaining and educational way to spend an afternoon. 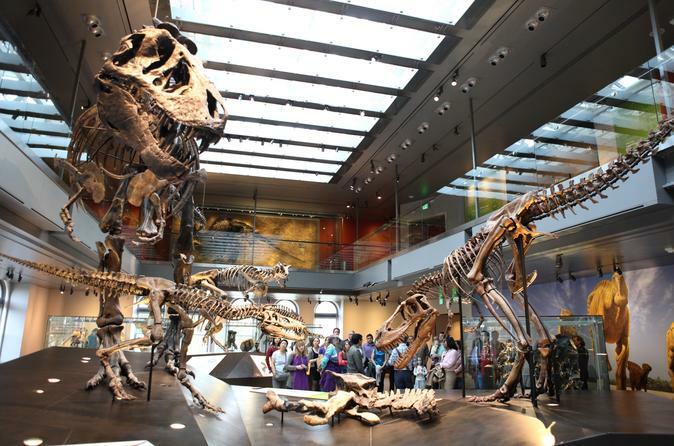 Spend an enjoyable and educational afternoon exploring the National History Museum of Los Angeles County with a general admission ticket, which offers you access to a wealth of exhibits. First, discover more than 300 fossils, marvel at 20 complete skeletons, and virtually excavate specimens at a series of multimedia stations in the Dinosaur Hall. Here, you can also view the world’s only Tyrannosaurus rex growth series, get a behind-the-scenes look at paleontologists in the Dino Lab, and see dinosaurs come alive at the Dinosaur Encounters show. Then, journey through an epic evolutionary story that spans 65 million years and includes 240 specimens — such as mastodon and whale skeletons — as well as animal dioramas from North America and Africa. Continue on to the Gem and Mineral Hall, which features more than 2,000 individual specimens and a vault containing diamonds, rubies, sapphires, and gold. Find out how LA went from a tiny pueblo to a sprawling metropolis in the Becoming Los Angeles exhibit, and take a stroll past native plant species in the Nature Gardens, where kids and adults can take a closer look at how things grow in the Get Dirty Zone. Before leaving, don’t forget to scope out L.A. creatures scurrying about the Nature Lab, and try your hand at interactive touch-screens that let you explore stories about Los Angeles’ plants and animals.